Steamforged Games, the designers behind the interesting but cooperative Dark Souls: The Board Game and Dark Souls: The Card Game, have set their sites on a new franchise: Resident Evil. 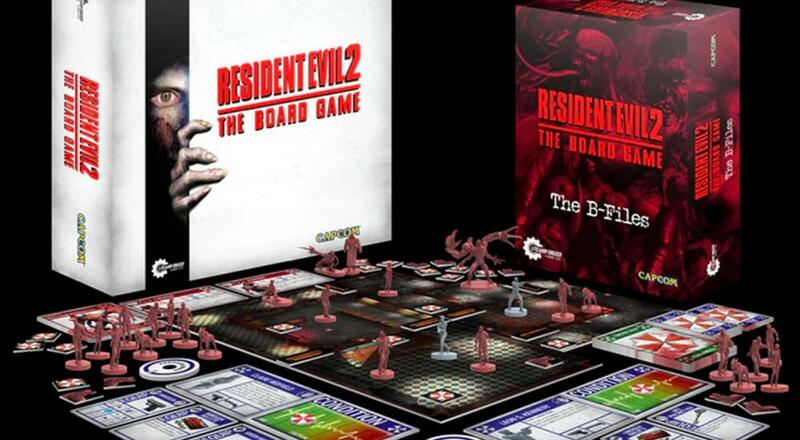 While there are still 25 days to go on the Kickstarter campaign, Resident Evil 2 - The Board Game has already reached (and exceeded) it's goal of $200,639. It's a rather interesting take on the iconic game. Up to four players must work together in order to complete a given scenario; if even one player dies, everyone loses. The scenarios themselves provide the players with a specific objective that they must complete in order to win, a diagram for how you setup/construct the game board from a selection of board pieces, and info on the various enemies that will be dropped in and items that can be discovered. To help create some of that feeling of unease and scares you'd encounter while playing the game, Steamforged utilizes something they call the "Tension Deck." At the end of every player's turn, they draw a card from this deck, which might cause some bad things to happen. It sounds, in practice, like the mechanic from Pandemic where players draw cards from a deck at the end of each turn and hope they don't draw an "Epidemic" card. There's a full hour long video that goes through a few turns of the game so you can check out for yourself how it's played. There's only one pledge level available on the campaign, about $90 if you're interested, but the good news is that it will get you the base game, the B-Files expansion, and all the extra stuff unlocked via the Kickstarter stretch goals (quite a bit of stuff). If you're really digging what you're seeing, then they also have expansions available to add on to your pledge that range in price. It's been nice to see a rise in cooperative board games the last few years, and it's always a bonus when they're based upon such well-known video game titles. Page created in 0.5939 seconds.